I started this “book” (listening to lectures) a long time ago and am only finally finishing it. What prompted me to really finish is that I was reading Michael Pye’s The Edge of the World and there was a chapter on Vikings specifically. I wondered how different it would be. Another reason for reading this – the original reason actually, is that I’m of Norwegian ancestry on my mom’s side and one branch came from an area heavy with Vikings (Tingelstad) – my dad’s side came from Finland. Listening to lectures is quite different from listening to “books” – it took me awhile to get used to it. The narrative of lectures is usually not as polished and literary but there seems to be more information. The course is broken into 36 sections, each about 30 minutes long. start with the Vikings in Medieval history in general and go to their legacy covering myths and legends, kings and heroes, shipbuilding, various assaults on Europe along with other explorations down to Byzantium, St. Olaf and King Cnut, the Crusades and Christianization. It’s pretty inclusive and quite interesting. Of particular interest were the sections on Ireland, Iceland, Russia, and how the Viking era transformed under Christian rule and became solid, prosperous, respected nations in a modern world. Long ago I read a book called The Long Ships by Frans Gunnar Bengtsson (1946) and that is such a delicious book, quite humorous and one of the best historical fictions I’ve ever read. I’ve also enjoyed The Greenlanders by Jane Smiley, Independent People by Nobel laureate Halldór Laxness, The Blue Fox by Sjon and several other historical fictions set in Scandinavia. 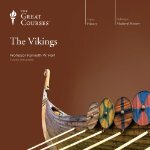 Listening to something like The Vikings gives me more background for the fiction I read in addition to understanding my ancestors a bit better. And I’m looking forward to finishing the Edge of the World, too – I think I may have to go back and review the chapters on the Vikings.